Are you ready for the school year? From lunches to snacks, families are buying more food. Make your food dollars stretch with Aldi. Do you shop at ALDI's? ALDI is not your traditional grocery store. They do not have multiple brands of certain items because they believe in bringing only the best products based on taste and price. They also have fresh produce. And although they don't accept coupons, their price is quite low. 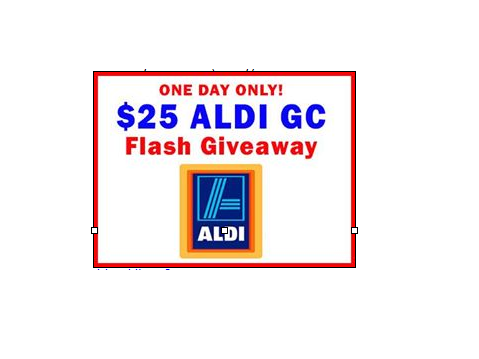 Join our flash giveaway today for a chance to win $25 GC to spend at ALDI. Please wait for the rafflecopter to load above. Giveaway runs 8/15 (Friday) 12:01am and ends 11:59pm EST. We like to get fruit and veggies at Aldi. I like dairy products at Aldi's. I do shop Aldi! Great prices on meats. I shop at Aldi's. I love their meat. I love to shop there so far we love the butter and bacon! I buy all of my produce at Aldi!!!! !